Today we are interviewing Ken Rossignol, author of the Marsha & Danny Jones Thrillers. As a longtime journalist and author, I have had the very great advantage of knowing real people, on the street in the process of news coverage and meeting thousands of folks at book signings and speaking gigs. That experience makes it easy to understand how people think and interact, especially on ships that are the backdrop for this series. Describe the Marsha & Danny Jones Thriller Series for readers just learning about it. If you are one of twenty-three million people who sail on cruise ships you know quite a bit about the experience. In this series of books, the goal is entertainment through the window of ‘what if’. What if the waiter bringing room service had a Glock on his tray? What if the grill cook at the pool buffet was smuggling bombs for a terror group? What if one of the women in the Yoga class was a former Secret Service agent ready to render a terrorist lifeless? Likely those who have been on more than one cruise and are looking past the first cruise for more adventure or anyone seeking a good beach read. Those who might be fans of the old Thin Man series or Hart to Hart TV drama might enjoy this series. 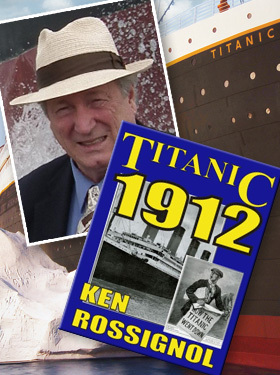 One of Ken Rossignol's non-fiction titles. 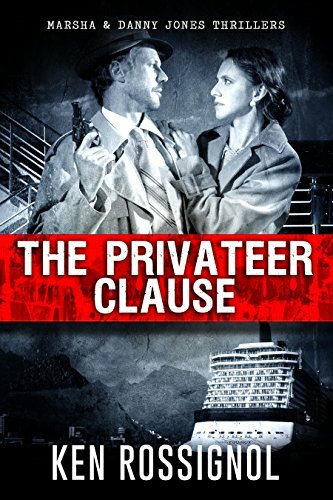 What inspired you to write a series about a husband/wife team that decide to break the boredom of retirement by becoming security consultants for a cruise ship company? I was on yet another cruise and keeping abreast of world events I imagined what if the security of the ship was threatened; who and how would the first responders of the sea act to counter any threat? Tell us a bit about the protagonists, Marsha, and Danny. Marsha is clearly the thinker and sometimes the brawn while Danny is usually the brawn but also has a somewhat sixth sense of impending danger and doom. Their long-time law enforcement experience combined with their deep relationship with each other is often the key ingredient needed to come up with the winning hand. In addition to the thriller/mystery elements, humor plays an important role in the series. Has humor always been a big part of your writing? Or is this something that has developed recently? The dramas in the past which were set on a cruise ship; think Gale Storm, Love Boat, even Gilligan’s Island…just for fun…all of them had humor as a backdrop to the human experience. Thus including humor – which is a key part of everyday life on every cruise I have been on either as a passenger or a speaker – is natural. I have written political humor using dialog or about twenty-five years and finding humor in politics isn’t that tough. If I could have had my ideal job upon graduating from high school, it would have been being a writer for Bob Hope. At least he would have laughed at my application. How many books do you have planned for the Marsha & Danny Jones Thriller Series? Given the way passengers react to the dangers and calamities of the Sea Empress and keep coming back for more, I suspect there are new adventures coming soon to the six books already published. Can you tell us a bit about your creative process, from initial idea to finished manuscript? A good deal of each book of this series has been written while on a ship. I can write near a pool deck, in a lounge or on my balcony. With the rolling waves, the great visuals and constant contact with passengers and crew, I only need to conjure up the bad guys. The only added ingredient I need is classical music with my Bose earphones, and I am set. Are there any authors how have influenced your writing style? Sure. Walter Lord, Ludlum, Twain, Dashiell Hammett. Taylor Caldwell, Jack London and more. I treasure my readers and my editors. The format doesn’t matter. Good books are always good books, and ebooks make it much simpler and easier for readers carry them around. Yes. Obituaries. I have written thousands and now only intend to write for bad guys in my books. I enjoyed writing them for friends I knew well and was a chance to write a final chapter on a good person. I did one for a friend and after staying up all night to lay out a three-page special I realized that I didn’t hold a mirror under the nose of my dead friend to make sure he was dead. As he was fully capable of staging the entire event, including having the cops call me to come to his house to identify him, I actually called his son to make sure he hadn’t pulled the grand champion of jokes. He was dead alright, and his memorial article was secure and safe for publication. When you are publishing to a schedule either on the news or trying to meet goals on books, you don’t get that luxury. That only takes place in the movies. I have used all starting at age twelve and computer is the best. I still have my old Royal from eighth grade. You’ve also written a number of books outside the Marsha & Danny Jones thriller series. Can you tell us a bit about your other works? True crime and maritime history are my passions. Both come to life in the Marsha & Danny Jones Thrillers as well. 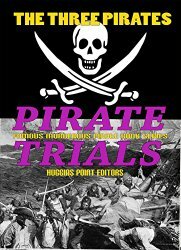 Piracy is a real kick for many folks, and I decided to dust off old journals of trials and pirate stories in my Pirate Trials series. The Hollywood pirates are fun and the real life killers of the high seas from two hundred years ago need a more realistic view painted for the reader. Real Pirates and the Bermuda Triangle lore are two of the most well-attended talks I give on cruise ships. The third in the series of CHESAPEAKE 1850 is underway and will be done soon. This series follows a family from 1850 to the present time, and the setting is the greater Chesapeake Bay region. Real history is mixed with the fictional family. The largest commitment of time for the reader in the series is in the first book. After that, the books are like dime novels except they cost more than a dime. They are intended to keep the reader interested, tell a tale and then get out of your life quickly without wearing you out. Great in depth interview. Many thanks!